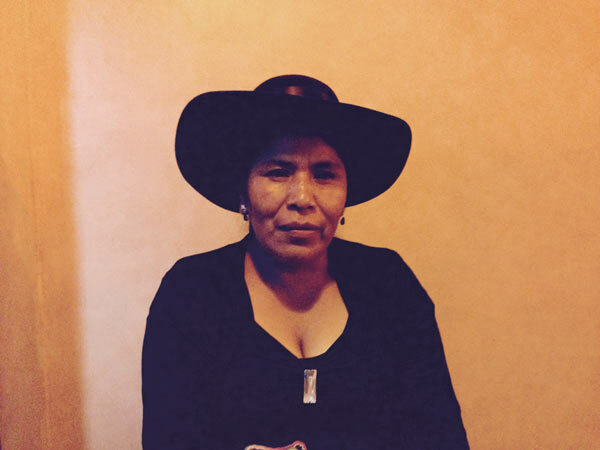 Toribia Lero, an indigenous leader from the faction of the indigenous organization CONAMAQ (National Council of Ayllus and Markas of Qullasuyu) that is not recognized by the government sits for an interview. The Danish NGO Ibis’s funding of this organizations is likely one of the reasons it was expelled from the country. Photo credit: Alexandra Ellerbeck. For much of Bolivian history, environmental and human rights NGOs joined indigenous communities and the poor in an uphill battle against the entrenched old guard. Under the country’s first indigenous president, these organizations face unexpected challenges. On Tuesday, September 9, 2008, a warning phone call prompted the staff of the Center for Legal Studies and Investigation (CEJIS) to flee their offices on the outskirts of Santa Cruz, the largest city in Bolivia. The NGO, a longtime defender of the rights of indigenous communities and indigent farmers, took the threat seriously. Minutes later, a convoy of cars crashed through the compound’s front gate, scattering the four police guarding it. Around 50 men armed with clubs, knives, firecrackers, and stones smashed their way into the building, where they wrecked property and destroyed much of a nationally recognized library. Outside, they burned documents in a curbside bonfire. 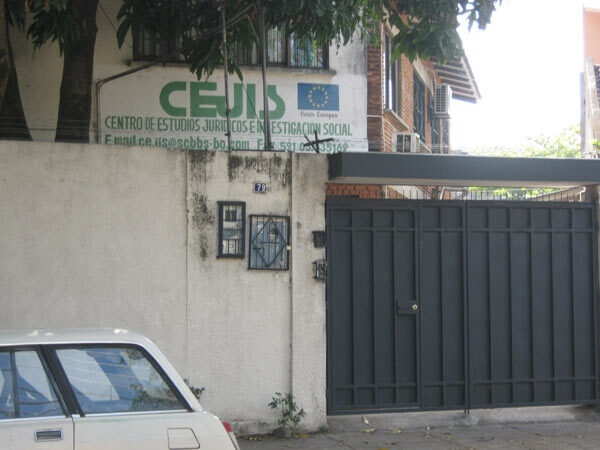 The CEJIS office which was attacked by right wing vigilantes in 2008 for the group’s backing of the Morales government. Since then, CEJIS criticism of Morales’ environmental and other policies has resulted in the group’s censure, and possibly government persecution. Photo in the public domain. Tensions in the tropical city had come to a head: Two years after Evo Morales, Bolivia’s first indigenous president, took office, the nation was set to vote in a long delayed referendum that would radically rewrite the country’s constitution, expanding political say and land rights for indigenous constituencies who had long battled exclusion and persecution. Those supporting the changes — including most NGOs — endured backlash from the old guard, which had plenty to lose. CEJIS and others paid dearly for their willingness to support the causes Morales represented. The new constitution passed and came into force. 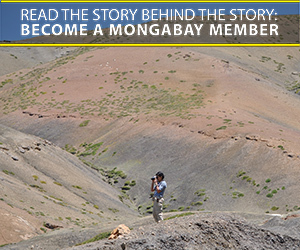 It was lauded by indigenous rights activists the world over. Environmentalists were pleased with its guaranteed right to a “healthy, protected, and balanced” environment. Morales — at the helm of his political party, the Movement Toward Socialism (MAS) — has remained in power ever since, and has benefited from a broad base of support. Originally part of a rural farmers’ movement, the party counts constituents among indigenous groups, peasants, urban workers, the middle class, and intellectuals. Celudonio Corumeche sits in front of poster given to him by the sugar processing company for which he used to work. Above the poster is an advertisement for a local political candidate from the opposition, but Corumeche wears a shirt depicting Evo Morales, which was given out by a local candidate for the governing party. Photo credit: Alexandra Ellerbeck. Morales nationalized natural resources, but the private sector — including transnational companies — remained prominent stakeholders. Threats from the radical right dwindled. But for CEJIS and likeminded NGOs, a future that should have looked brighter than at any point in recent memory, remains murky, uncertain and burdened by worry. The Morales government faces a dilemma inherent in the transition from populist outsiders to entrenched incumbents. Prior to coming to power, MAS and its base of peasant and indigenous organizations allied with NGOs in confronting a conservative government that favored the privileged elite. In the wake of the 2009 Constitutional Assembly, the old guard was defeated and Morales’s base gained an important victory, but lost its common rallying point. No longer united against a common enemy, tensions began to emerge between a Morales administration focused on development, and others with civil and environmental goals. The ruling left has faced a crisis within since 2010, when Morales announced a large-scale highway project that would bisect protected Amazonian rainforest and indigenous territory in the TIPNIS National Park. The preserve covers some 2.5 million acres, is home to the endangered giant otter (Pteronura brasiliensis) and contains some of the most biodiverse, and poorest, areas in Latin America. 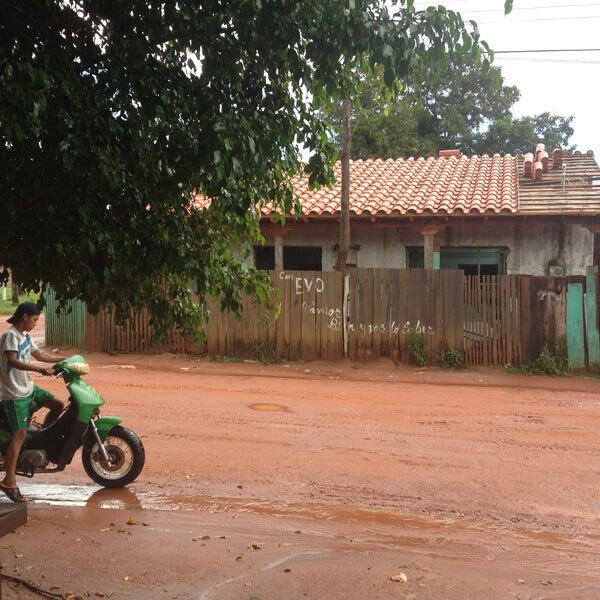 MAS promised a deal too good to turn down: Brazil would bankroll construction, the project would create jobs, and isolated rural communities would gain newfound access to services and markets. 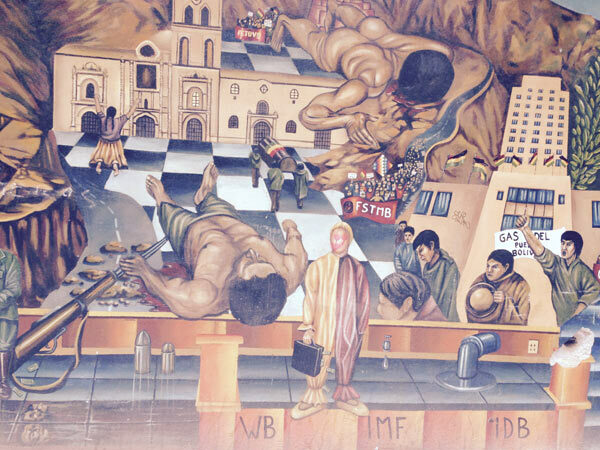 A mural on the side of the road in La Paz, Bolivia depicts the country’s history of workers’ struggle, referencing the protests of the miners Union and the protests in 2003 in favor of the nationalization of gas. Photo credit: Alexandra Ellerbeck. Environmental activists and indigenous leaders felt differently about the highway, arguing that Morales’ core constituents ¬– coca growers — stood to gain the most, while locals would suffer drawbacks: loss of control over their own affairs and harm to the environment in a region notable for its biodiversity and autonomy. In 2011, two large indigenous organizations organized a two-month march — a form of protest with a long tradition in Bolivia. Participants walked from the jungle city of Trinidad to La Paz, the capital, perched in a high Andean valley hundreds of miles to the west. CEJIS, the NGO that had its office trashed by anti-Morales vigilantes, counted itself among the march’s supporters, as did other environmental and human rights groups. The ragtag band of indigenous activists swelled to a throng of thousands by the time it reached the streets of the capital. There, a great gathering of supporters assembled to greet the marchers. The international press, including outlets that usually passed over Bolivia, smelled a good story and parachuted in. The government’s verbal attacks were aimed at silencing the NGOs. “We find ourselves essentially gagged and handcuffed when it comes to replying [to], criticizing, or arguing about the government’s development policies, which are currently out of control,” said Marco Ribera Arismendi, a spokesman for the League of Environmental Defense, a network of conservation organizations in Bolivia that was censured by Canelas. On the international stage, Morales has advocated for strict measures to address climate change, equating it to “genocide.” He has criticized developed countries for creating the bulk of emissions, and pushed the U.N. to mark April 22 as International Mother Earth Day. At home, however, he has found himself pinned between colliding purposes: the need to support an economy almost entirely reliant on extractive industry for the rents that fund popular government social programs, versus a demand for alternative development and environmental protection, a vision taken up by NGOs. 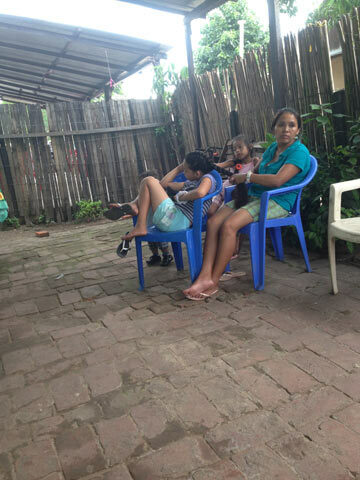 A young Guaraní woman braids the hair of a girl in La Bélgica, a small town built around a sugar processing plant. Photo credit: Alexandra Ellerbeck. Danish NGO IBIS was expelled from the country by the Bolivian government at the end of 2013. The NGO’s stated mission in Bolivia included “moderating the effects of climate change and the destruction caused by the mining industry.” The government accused IBIS of political interference and of trying to divide indigenous organizations. “One does not forgive conspiracy,” Morales said at the time. IBIS failed to answer queries regarding their expulsion for this article. Morales has directly accused NGOs of being part of a broad conspiracy to undermine Bolivian autonomy — a sentiment that strikes close to home in a country still recovering from centuries of oppressive colonialism. 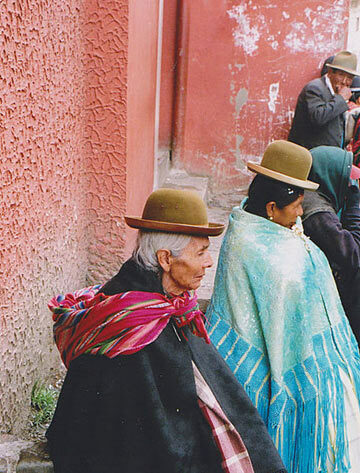 People of La Paz, Bolivia. Photo credit: Peter van der Sluijs under a Creative Commons Attribution-Share Alike 3.0 Unported license. The most influential NGOs in Bolivia do receive much of their funding from abroad. So it’s no surprise that a government that has built its identity on “decolonizing Bolivia,” freeing itself from foreign overlords and reclaiming sovereignty over natural resources, is suspicious of NGOs that receive a steady flow of foreign dollars and support activities highly critical of the Morales government on environmental or human rights grounds. Other challenges now facing NGOs are a product of the country’s recent economic success. As the economy prospers under Morales, many North American and European donors no longer see Bolivia as a priority country for assistance. Many have focused their attention elsewhere, leaving NGOs to scrape by with a small fraction of past funding. Meanwhile, the government has stepped up its social programs, redistributing newfound wealth to the population through social programs and small cash bonuses that go to pregnant women, school children and the elderly. Some NGOs now find themselves redundant, as the government expands its social commitment and works more directly with indigenous and farmer organizations. In 2013, Morales put a new set of regulations in place that allowed the administration more power to exert control over the mission and finances of nonprofits. New laws required NGOs to renew their registration with the government and reveal funding sources. The Morales government also granted itself sweeping powers to dissolve the standing of any organization that officials judged as straying from the “public interest” or from its stated and legally delineated purpose. The U.N. High Commission on Human Rights raised concerns about the law, on the grounds that it threatened freedom of association. “The worst part is when they tell you that you need to change that which you were created for,” said Patricia Molina, programs director at FOBOMADE, an environmental NGO that advocates for sustainable environmental policies and greater public debate of ecological issues. Her organization, she explained, cannot give up its political role and also comply with its mandate, which includes researching the environmental consequences of proposed bills, and monitoring compliance with existing legislation. Eróstegui from UNITAS was quick to point out that while NGOs have been asked to change their statutes, no NGO has lost its legal standing under the law — yet. The function of the regulations in practice, she said, is to create an atmosphere of fear and self-censorship within NGOs and civil society group. A man drives a motorcycle in front of graffiti that reads, “With Evo, we are good and you know it,” in the town of Concepción, Bolivia — the site of a Jesuit mission built in the 1700s to evangelize the predominantly Guaraní indigenous population. Photo credit: Alexandra Ellerbeck. “In the past, NGOs were more combative; they expressed themselves more on certain subjects. Now they doubt what to say, how to say it. They have significantly more fear,” Eróstegui said. While international NGOs must now weigh their actions against the fear of expulsion, a more pervasive and stifling concern is the daily bureaucratic hurdles they face. Hernán Ávila, the director of CEJIS — the organization targeted by right wing vigilantes in 2008, that opposed the TIPNIS highway and was censured by the Morales administration in 2011 — finds that his NGO is facing a greater existential threat in 2015 than it ever did in the past. A government regulatory body recently ordered CEJIS to pay $167,545 in allegedly missed labor fees from the period spanning 1988 to 1991. Ávila maintains that CEJIS already paid its fees, but that all records were burned in the 2008 right wing attack, which was motivated by hatred of Morales and his administration. “It’s paradoxical that the government is charging us for the documents we lost defending them,” Ávila said. “With this fine, we’ve broken the bank.” The pen and the law, it turns out, could be mightier than clubs, knives, firecrackers and stones. 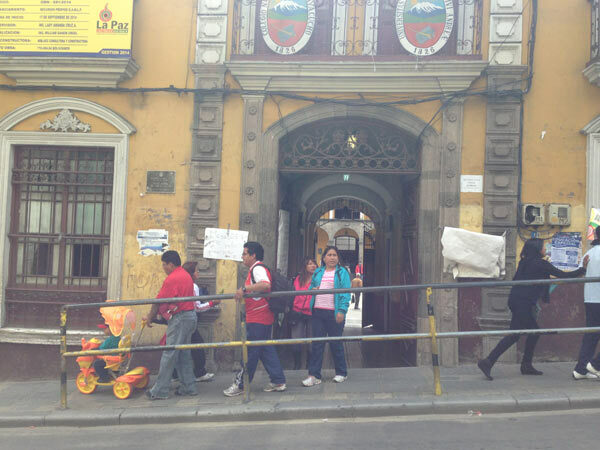 Voters file out of a Colegio Nacional San Simón de Ayacucho (The National High School of St. Simon of Ayacucho) on regional election day: March 29, 2015. In the midst of a major corruption scandal implicating members of the government, the President’s party, the MAS, suffered heavy losses, including the governorship of La Paz and el Alto, two regions that have been his bastions of support in the past. Photo credit: Alexandra Ellerbeck. Although CEJIS had collaborated closely with the Morales government in times past, relations soured after its criticism of the TIPNIS highway and recently passed laws, and its support for indigenous organizations that the government no longer sees as legitimate. approved, because we didn’t have our registration.” Velásquez suggests that NGOs dedicated to human rights work, who are sometimes more critical of the government, have more difficulty with registration. The government has found another tool for disempowering organizations. Rather than opposing NGOs head on, the Morales administration appears to be fomenting divides within groups to weaken them and silence criticism. On January 17, 2014, the Permanent Human Rights Assembly of Bolivia, a respected network of over 200 volunteers with roots reaching back to activism against the 1970s military dictatorship, held a meeting in La Paz that did not go as planned: Government supporters interrupted the proceedings, tore things off the walls and declared themselves the true voice of the organization. Police showed up shortly thereafter — the first invasion of the Human Rights Assembly by police since Bolivia’s return to democracy. The Assembly had opposed the TIPNIS project and other Morales development goals. 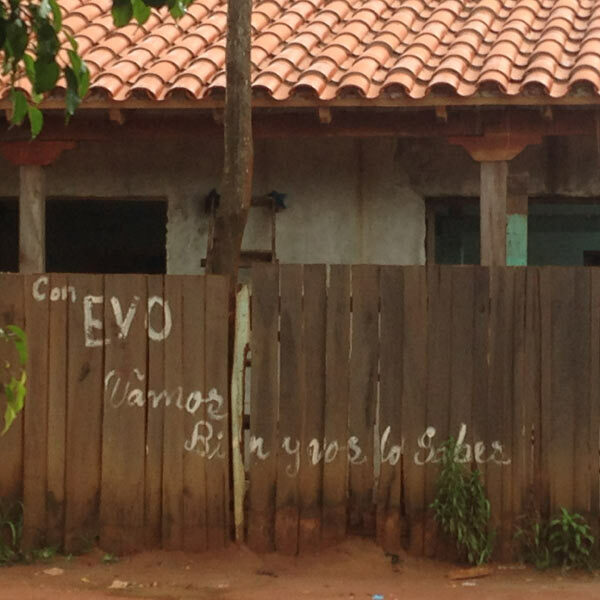 Graffiti reads, “With Evo, we are good and you know it,” in the town of Concepción, Bolivia — the site of a Jesuit mission built in the 1700s to evangelize the predominantly Guaraní indigenous population. Photo credit: Alexandra Ellerbeck. The attackers wrote on their Facebook wall that their goal was to “purge within the Assembly to take out right wing infiltrators… for betraying the country.” Carlos Romero, Minister of the Government at the time of the assault and now a MAS senator, denied ordering a police intervention. Government supporters present at, or affiliated with the attack, however, have since moved into important political offices or candidacies in the government’s party. The Morales administration has not fostered the open political climate for which environmental and human rights NGOS hoped. But they’ve not abandoned all optimism. In the coming months and years, the Morales administration will set policy for the future of agriculture, environmental protection, mining and nuclear power in Bolivia. NGOs want to be part of those conversations. Without a change in the status quo, they can expect a seat at the table, but not the chance to speak with total candor and at full volume.